Our kids are busy. On top of going to school, over 30 million kids in the US are in organized sports. If your kid is involved in an after-school activity, then you know that transportation is not readily available. The school bus will not wait for the kids participating in sports to finish, which means it is up to us, the parents, to find a safe way to get them to practices and back home. Add in your own busy schedule, and it feels overwhelming. Many people assume incorrectly that NYC parents don’t drive their kids around. People think that NYC families rely solely on public transportation or walk everywhere they need to go. Statistics show this is wrong. Yes, there are fewer families who drive daily in NYC than other parts of the country, but almost 1.4 million households in New York City own a car. Of the 1.35 million school kids in New York, 30% of are driven to school in passenger vehicles– every single day! Anyone living on the Upper West Side or in Queens trying to get their kids to German class at the UN International School on a Saturday morning knows that public transportation would take hours. All the vehicles on the already busy NYC streets are causing big problems. For example, NYC is the third most traffic congested city in the world. More importantly, Next City reports, “Roughly 90 percent of the city’s transportation greenhouse gas emissions come from private car travel.” Our streets are congested, and anyone in front of schools can attest that idling vehicles are also polluting the environment. Instead of stressing out about how to get everyone to every place they need to be and everything done that has to be done in your limited amount of time, take advantage of carpooling. As you can see, there are numerous benefits of carpooling for your family, New York, and the planet. Saving money– You spend less money when you share the driving load with a trusted friend or neighbor. Saving time– You create space in your schedule by taking turns driving the kids with someone you know. Add 2 families to your weekly soccer carpool to Randalls Island and you will easily save yourself 10 hours a month. Saving the planet– You significantly reduce your carbon footprint. Rather than multiple parents driving separate cars to the same place, one vehicle can transport the kids, lowering emissions. Safer, less congested roads– Fewer cars on the road means safer, less congested roads. Building community– Carpooling is a wonderful way to get to know your neighbors and for your kids to develop friendships. As parents who saw the challenge of getting our kids to school and after-school activities and sports while working, we assumed there must be an app to help parents with this issue. But, there wasn’t! We saw the need, and we took the initiative. GoKidworks to connect parents and alleviate the stress of getting your kids to school and their other activities. 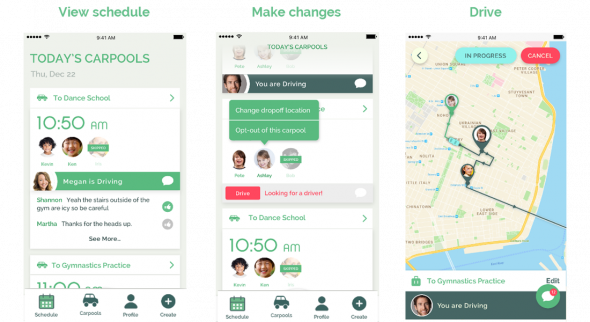 By signing up for the app, you will be able to create a carpool with parents you know and trust. 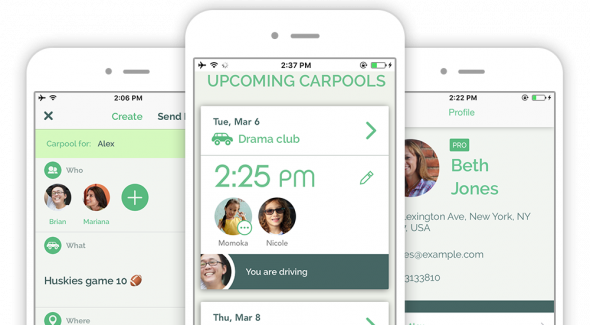 With the app, you can create a carpool schedule with your friends, receive automatic reminders when it is your turn to drive, see the optimized route to pick up and drop off each child, and leave notes on each carpool event for the other parents. No more chain text messages or spreadsheets – everything is handled within the app. 1. Download the app on Android or iPhone, then sign up and create a shared family password. 2. Add your family members to your profile – if you add a partner or babysitter, they can be assigned to drive and will get reminders and notifications too. 3. Press Createto start your first carpool – setup takes only a couple minutes. 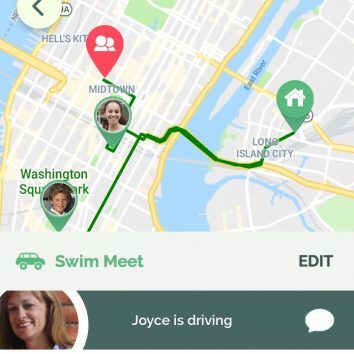 Choose friends you want to invite and set where and when the carpool is, then save. 4. That’s it – your invitations are sent and your invitees can join. The last step is volunteering to drive on the days that work best for you – everyone invited will see the same schedule, and GoKid will send reminders! 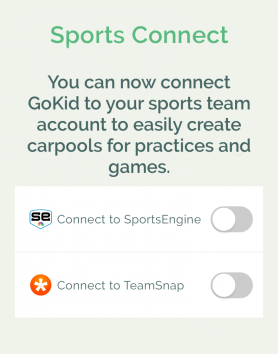 GoKid is also proud to offer a SportsEngine and Teamsnap integration that makes it super easy to set up carpools with fellow team parents. These integration features allow GoKid parents to see their child’s sports roster and schedule, as well as identify fellow team parents to carpool with for games and practices. Carpooling for youth sports has never been easier! GoKid parents already see a difference: 3+ million miles of driving have been saved through carpooling with GoKid with over 250,000+ rides scheduled. Plus, GoKid parents have already reduced 2,702 tons of CO2! Reduce your parental transportation stress and help improve congestion and emission issues in NYC by joining the GoKid family today. To help you get started, we’d like to offer CityKinder subscribers a free upgrade to GoKid Profor three months. Here’s how: After you sign up for GoKid, simply log in on the webapp (https://my.gokid.mobi), visit your profile page and choose Upgrade to Pro. Select “I have a promo code” on the upgrade screen and enter the code: USC2019. You will be upgraded immediately. Happy carpooling!